It's a Friday Your Next Stamp challenge and I have a cute little treat to share with you using a new die released this month. This new die is the Scallop Topped Treat Bag. It is so cute and perfect for making favor bags for a party or classroom party. Not to mention this is so super easy as the die makes all the markings for you. The score lines are even there! For this, I cut out some patterned paper with the die and decorated it using the mini gingerbread boy/girl set and Christmas words die set. The open scalloped circle die was used for the back panel. When opened, two little treats are inside to give. Hoe fun is this? I just love giving little treats and having a die to make multiples of them, makes it even better! Be sure to check out the YNS Blog for all todays challenge inspiration and hope you have a great weekend! It's time to dare you once again... that's right! It's this months Your Next Stamp's DT Dare and the team is sharing and creating with you their Favorite Things. This newest release from YNS has been such a hit and it couldn't have been paired more perfectly as it was with the DT 12 Days of Gift Giving. So, for this dare of our Favorite Things, I have to share with you a set released that helps celebrate the new year. This set is called Happy 2016. This card uses quite a bit of different items from this release such as the stitched oval die set and the Bow-tiful Little Bows die set. The image was colored in with Copics and cut out to be popped up over the oval cut out. The year was stamped directly onto the oval base and colored in with Copics. The top of the party hat on the number '2' was given a mini pom pom for some added texture and element while the card was completed with some yummy Give Thanks Gumdrops. Be sure to check out the YNS blog and comment for your chance to win a stamp set of your choice! Thanks for stopping by and hope you all have a great Monday. For my first card, I am using the new set of Coffee...Right Meow! hee hee... I just love it too! 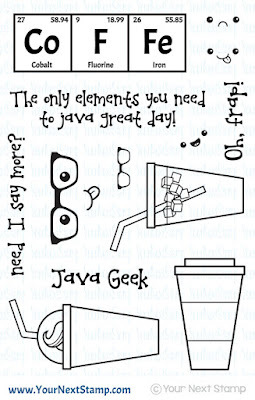 It has all the favorite coffee sayings for all you coffee lovers out there. And for you cat lovers who love coffee? Even more perfect. For my second card, I am using Blast Off. Such a great set for your space or astronaut lover. 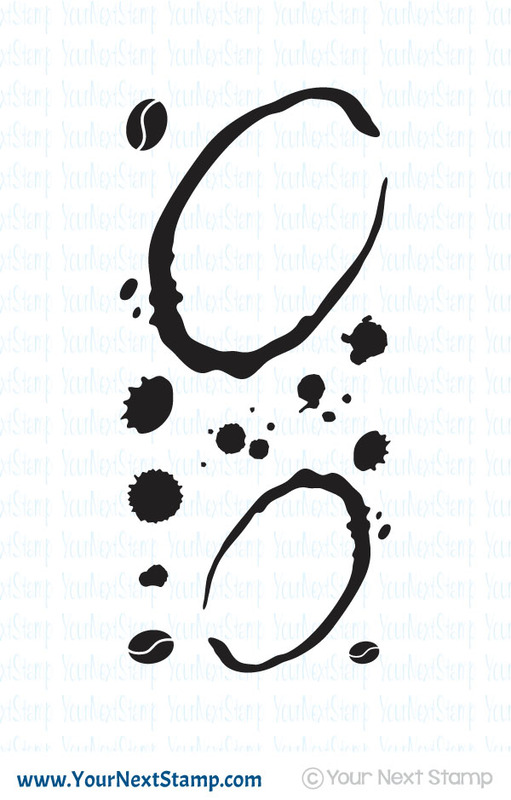 In conjunction of this set I used another new release of the large Star Splatter background. This was used as my background which I stamped with Versamark and heat embossed it with some Iridescence embossing powder. The super cute image was colored with Copics and fussy cut out and popped up. The "moon" was made using white card stock and embossed with an embossing folder and a circle punch to make the shape. I completed the card by stamping the stars in the set, cutting them out, and turning it over to show just the white so that I can run it over with my Wink of Stella. It is hard to tell in the picture unfortunately. For the sentiment, I stamped the bottom portion with Sprout Memento ink and then Cottage Ivy on the top for a sort of ombre look. This release has so much fun creative uses that Karen even has an awesome special to make spoiling yourself easier. Your order will be 20% OFF with the coupon code below. How sweet is THAT?! Don't forget to keep hopping and leaving a little love as you go on the DT blogs. You could be the winner of a $20 YNS gift certificate to the store. The winner will be posted on 14 December. Thanks so much for stopping by! Happy shopping! The time is here for the December sneak peeks for Your Next Stamp! There are so many fun and unique sets that it will be hard for you to make your list. Besides the sneak peek I am going share, I will share with you this... Did you know this is the year of the Monkey?? :) Have I perked your curiosity? 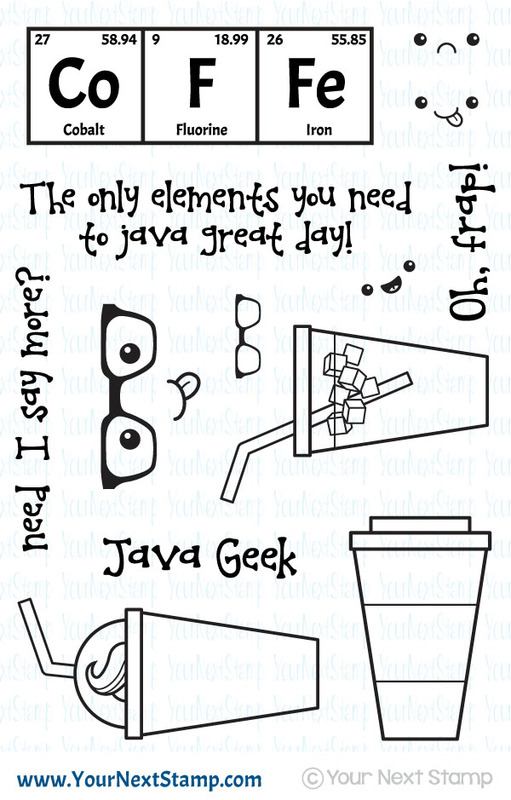 For my card, I am using two new sets - Coffee Rings and Java Geek. These couldn't be more perfect since I am a coffee-holic. And for those of you who may have picked up our Perfect Chemistry set earlier in the year, this is a perfect addition to that. How fun are these sets? I started with a brown card stock base and cut out the main layer with the Stitched Rectangle set in a confetti creme card stock. The coffee ring was stamped with Memento Cocoa Brown ink while the elements were stamped with Memento Espresso Truffle, cut out, and popped up. I stamped the cup on the same confetti card stock and cut out a piece of kraft card stock for the sleeve. The look was completed by adding the glasses to be popped up, the sentiment, and some gumdrops in Latte. Be sure to check out the other fun creations from the DT to get this months mojo flowing! Thanks for stopping by and hope you have a great day! If you haven't been following, Your Next Stamp is doing a series on the 12 Days of Gift Giving with the Design Team making items for easy gift giving ideas using various dies in the YNS Store. Today is day 7 and I am happy to share with you an easy ornament using simple circle dies and the Bookmark/tag die set. To start, I chose a photo I wanted from my computer to be printed out on basic card stock. This was ok to do because I knew I was going to laminate it. You could always print it out on photo paper to eliminate the lamination. Once I found the picture, I used Photoshop to size it so that when I cut it out using my dies, the main image will be centered. Once printed, I cut the photo out and placed it in between the laminating sheets and ran it through the lamination machine. When that was finished, I ran the picture through my die cutting machine with the chosen circle size for the ornament. Using red card stock, I used the largest sized Bookmark die to be the topper of the ornament, cutting about 3/4 of the size. You could always shorten it to your liking since you will have two circles holding this in place. I ended up trimming a bit more off the tag to rest nicely between the two circles. Speaking of two circles, I used the largest sized Circle Die to cut out two circles to be the "ornament ball." This is also the time to use the coordinating stitched circle marks to stitch the outline of one (or both) of the circle. Now choose a coordinating patterned paper to place in the center for your photo to overlay with cutting it out with the next smaller circle die. For mine, I used some Studio Calico paper in red with some white swirls. Now adhere the photo to the center of that. The ornament is starting to take shape, but I wanted to add a little more. It needed some wording, so I used my Silhouette Cameo to cut out the year, the team name, and LAX in black card stock. I positioned the lettering where I wanted it before adding some glue dots to the back and placing them on top using my fine needle tipped tweezers. This is almost done, but it needs some ribbon for hanging and of course just a little bit of bling by using the new Holly Jolly gumdrops. I sure hope you enjoyed this tutorial and hoped I was able to help with another idea for gift giving this year. You can find all the dies and gumdrops mentioned in the YNS Store ready for your creative ideas. Thanks so much for stopping by and hope you have a great start to the week! A happy day it is for me. The week is over, let the weekend begin, and my husband comes home after a week away for work! More importantly, the rain has stopped and the sun is shining.. woot! Today is another Friday Challenge over at Your Next Stamp and the sketch is so much fun! There are many opportunities to make fun winter/holiday cards with this layout and for my card, I couldn't resist making one using Penguin Buds. These two little mischievous guys make me smile. I stamped and fussy cut them out to be popped up over the curved center panel while stamping the sentiment directly onto the panel. The patterned paper is from Studio Calico and I finished it up by adding some white dots with my gel pen onto the corners and some yummy Holly Jolly gumdrops for sparkle. Be sure to stop by the YNS Blog to see the other fun creations made by the DT and hope you will join us on playing along! Don't forget to check out the 12 days of Gift Giving series while you are there. One DT member is sharing an idea for making fun and cute holiday tags, calendars, gift card holders, etc! You don't want to miss it. Thanks so much for stopping by and have a great weekend!